Now hiring experienced gate techs and welders. The Gate Doctor® is one of Georgia’s finest gate and access control companies servicing the greater Atlanta metropolitan area. We are dedicated to servicing and providing the installation of residential, commercial, and industrial systems. Our team of highly trained technicians are able to quickly diagnose and repair gate and access control systems. We proudly offer customers over 20 years of security experience! The Gate Doctor® is uniquely different from other fence and gate companies in this area. The Gate Doctor® understands that their customers have different gate needs, and we work hard to match the need of customers with the appropriate equipment at a price that meets the customer’s budget. The Gate Doctor® manufactures specialty gates and is able to personalize them to meet personal or business desires by adding logos, or personal designs. The Gate Doctor® also offers a large assortment of economically pleasing gates and fencing materials for customers that do not necessary need fabrication. We are members of the AFA (American Fence Association)! Peace of Mind: You will no longer have to worry about your home or property. Children and pets will be prevented from meandering into the road. You will have the security of knowing that intruders cannot wander onto your property. This will deter theft and prevent burglary. Some gate and fence companies offer do-it- yourself gate and fence materials. On more than one occasion The Gate Doctor® has been called out to work on a system that was improperly installed, causing equipment damage or failure. The Gate Doctor® offers a variety of Preventive Maintenance programs for residential and commercial customers. Although we work to provide all customers with same day service, by having a contract, you are guaranteed same day, and 24 hour emergency service on most gate and access control systems. Our sales team provides support to management companies and neighborhoods, and attends Home Owner Association meetings upon request. Our experienced technicians respond quickly to your system needs. The Gate Doctor® technicians are consistently given praise by customers for providing excellent customer service. They spend time with customers reviewing equipment functionality and programming. Home owners are provided as much knowledge as they desire to be able to trouble-shoot their personal equipment prior to calling us for service. Often customers will call our office for over-the-phone, basic trouble-shooting on their system. They are consistently greet with professional and knowledgeable staff that strive to answer all of their questions, and schedule appointments as efficiently as possible. Georgia is home to over 50 access control and gate servicing businesses. 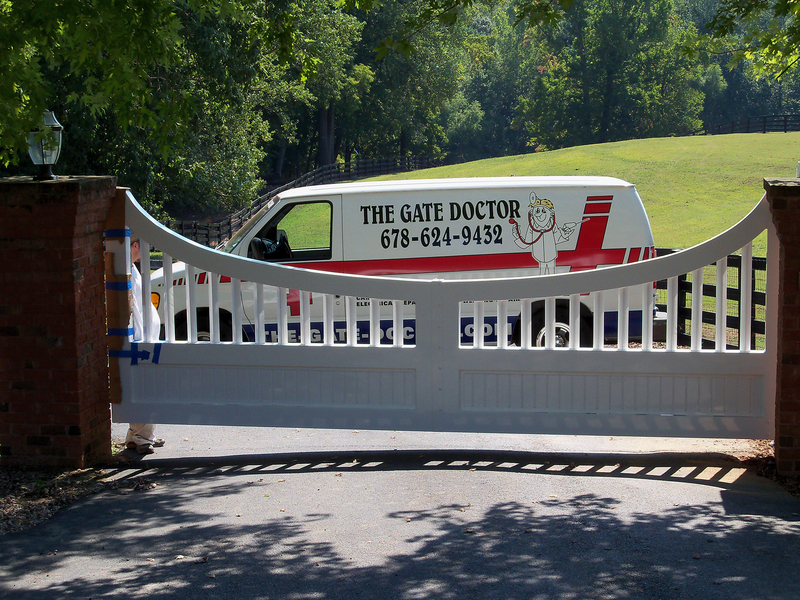 The Gate Doctor® strives to provide the best service possible, at the most reasonable price. We are a small business and this does give us the added advantage of being able to pass lower pricing on to our customers. The Gate Doctor® routinely works with customers to provide systems that meet budget requirements, and we will always meet or beat of competitor’s written estimates. Call us today for a free written estimate. Receive an automatic 1-year installation guarantee on all new gate openers and telephone entry systems installations. The Gate Doctor®is a company servicing Atlanta, Georgia and its surrounding city’s that’s dedicated to keeping you and your family safe with automated gates that won’t let you down. Our custom swing and slide gates are built to fit your needs. With some of the brand names like Apollo, FAAC, DoorKing, Linear, Liftmaster, Power Master and BFT, you are bound to get the best equipment available. We provide one-on-one personal service for all our clients—residential, commercial installation and service with a smile. The Gate Doctor® provides design assistance, turn-key installations and full service systems for automated vehicle gate systems, card access control systems and closed circuit television systems for multi-family and single family residential, commercial, and industrial clients in the Atlanta metro and north Georgia area.